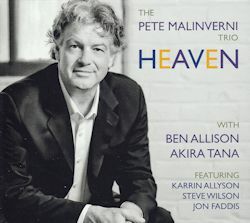 Pianist, composer and church musician Pete Malinverni is joined by fellow jazz educators Ben Allison and Akira Tana to form the core musicians who recorded this concept album. The idea was to play music drawn from diverse traditions such as spirituals, folk, soul, and Duke Ellington's sacred music, with the common theme of heaven. I like Malinverni's definition, in the liner notes, of heaven as 'the presence in everyday life of the stuff with wings', a memorably oblique way of describing the beyond in the ordinary. There are three guests on the album. Five times Grammy nominated singer/pianist Karrin Allyson brings her crystal clear voice to Shenandoah. Multi-instrumentalist Steve Wilson, much in demand as a sideman throughout his career and also involved in jazz education, can be heard on alto sax for Wade In The Water. Finally, there's the vastly experienced Jon Faddis on trumpet on Come Sunday. Faddis, who is known for his work with pop stars such as Billy Joel and Paul Simon as well as with a host of jazz luminaries, teaches in The Conservatory of Music at Purchase College, New York, where Malinverni is Head of Jazz Studies. Every track has something special to offer but four merit particular mention. I'd not heard of Hannah Senesh (to give the anglicized spelling of her name). She was, however, parachuted into Yugoslavia during the Second World War by the Special Operations Executive of the British Army as part of an attempt to rescue Hungarian Jews from transportation to Auschwitz. She was captured, imprisoned, tortured and finally executed by firing squad in November 1944, aged only 23. She leaves behind not only the witness of her courage but her poetry. Eili, Eili ( My God, My God) is a musical setting, also attributed to her, for one of her poems It's a memorable piece played with tenderness and sensitivity by the trio and evoking hope as well as sadness. Malinverni is at his empathetic best here. Duke Ellington's Come Sunday features the muted tones of Jon Faddis who creatively explores the theme, accompanied by Malinverni and is another rich listening experience. I wasn't familiar previously with the spiritual A City Called Heaven but was impressed with this version, with bassist Allison taking a leading role. Best of all, though, is Ashokan Farewell, a Jay Ungar tune, beloved of Classic FM listeners and remembered for the number of times it was used to haunting effect during Ken Burns' eleven hour series about the American Civil War. It's perhaps hard to go wrong with such quality material. Still, Malinverni's playing proves to be sublime and near faultless. This is improvisation of a high order, supported more than ably by Allison and Tana. Earlier on the disc, Malinverni offers a musical setting of his own of Psalm 23 which has a strong gospel-oriented undercurrent throughout and allows drummer Akira Tana scope for his talents, too. Singer Karrin Allyson's clarity and strength ensures that the full beauty of Shenandoah is conveyed. Another Ellington composition, Heaven, is a successful team effort, with plaudits due all round. The spiritualDown In The River To Pray is handled imaginatively and Wade In The Water is guaranteed a straightahead jazz approach through Steve Wilson's vigorous performance on alto, backed up in particular by Malinverni. The Curtis Mayfield soul classic, People Get Ready, gently swings with a jaunty feel to it at times. This album provides enjoyable listening. The relaxed ambience and musicianship will commend it to a wide audience.